In the dawn of the CD-ROM era, a little known company named Trilobyte set off to develop a software that aimed to harness the capacity of the CD-ROM to deliver the multimedia capability of the home computer. 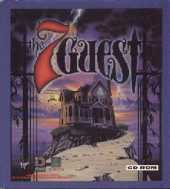 The end result was the market hit called The 7th Guest. With its incredible graphics and sound effects, it has been considered by many to be the "killer app" that set off the CD-ROM market. Countless CD-ROM drives have been sold bundled with this software to show off the capability of the device. The story occurs seventy years ago, where an enigmatic drifter named Henry Stauf created a toy making empire by seemingly crafting incredible toys from his dreams. This reclusive, wealthy but twisted toy maker invited six guests to a party at his hilltop estate, promising to fulfill their desires for great wealth or power only to have them all disappear. Seventy years later, while visiting the now deserted mansion, you are suddenly transported back in time as an entity known as Ego only to witness their cold-blooded murders which revolve around a mysterious "7th Guest." The identity of this guest is finally revealed when the evil Stauf and his sinister puzzles are defeated. High resolution SVGA graphics detail the mansion's 22 rooms, along with fully pre-rendered transition Full Motion Video (FMV) clips between locales (first time ever used in a game). Soundtrack is scored by the reputable George Alistair Sanger, also known as The Fat Man around the MIDI circle. The musical scores are found in its entirety on the second CD, which can be played like a conventional audio CD. Back then, no third party utilities exist for the creation of the 3D rendering and video playback. All these technologies had to be developed in-house specifically for this title. There was a revamped release in 1995 that only added native Windows 95 support. Some manufacturers reported a surge in demand of more than 300 percent shortly after The 7th Guest arrived on store shelves. More than 2 million copies of the game have been sold worldwide. This is a 1st person, single button point and click game with a 'smart' cursor: it changes to a skeletal hand for movement, a drama mask for ghostly videos, chattering teeth for supernatural events, and a throbbing brain and eyeball for puzzles. You gradually explore the 22 rooms of the mansion and as you solve the puzzle located in each room, other rooms open up and more of the story is revealed. A new type of adventure at the time, the game lacked an inventory, dialogue options, or even a visible player character; its gameplay was entirely comprised of standalone logic puzzles, brainteasers, chessboards, and mazes. Its ground-breaking use of live actors, at a time when few adventure games even had voice acting, also opened the floodgates for a torrent of FMV adventure games in the years that followed. And nearly two decades later, its puzzle-based format lives on in series like Professor Layton. In Apr/2019, a remastered 25th Anniversary Edition was released with a totally new, much praised, game play controls that were built from the ground up; Hotspot based with the option to highlight all hotspots in each game screen; Skip quickly any scene; Completely new map, which can be access directly from the game screen; Completely new game menus and save/load system; Three Music options - The praised, orchestrated, music score re-mastered or the original score in high quality Midi recording or Adlib; Much improved voice acting audio and all-new, optional subtitles; High-end graphics upscaling (xBRZ filter) for high-resolution displays; Optional retro settings - play with original graphics, original music and even the original controls (mouse pointer). It has a lot of extras: ‘The Making of’ featurette; 19 Deleted Scenes and 34 Deleted Audio Parts; Comprehensive Soundtrack: 36 Tracks to add to your music collection; ‘The 7th Guest’ Novel (157 pages); The Original Script (104 pages), ‘The Stauf Files’ booklet (20 pages), Original Game Manual (41 pages); Legacy Editions as FREE downloadable content (DLCs) for Windows, macOS and Linux (English voice-acting only); Multiple languages (ALL included without additional payment); English, German, French, Russian voice acting, with or without English, German, French, Russian, Italian, Portuguese, Swedish or Hebrew subtitles.